The 2003 foals are all here! 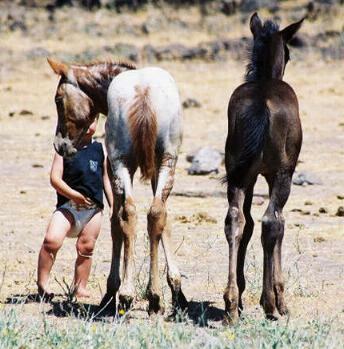 We are exceptionally pleased with this years foal crop! Three of them are 100% FPD. All are for sale and prices are always negotiable :D See something you like, let us know. 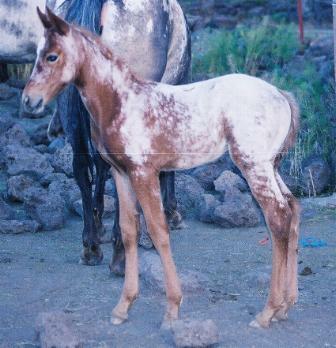 We are happy to send pictures, extended pedigrees and videos. 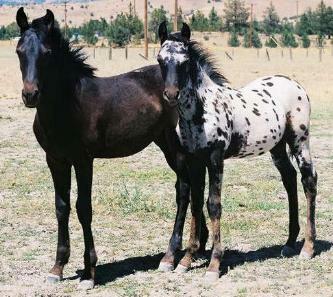 Born on March 19, 2003 Mystic Ebony Lace is a gorgeous black filly with hip spots. Sired by Rainbows Dreamweaver and out of Oaks Mystic Wind (who is out of a Storm Cloud F granddaughter) Lacey is 100% FPD. 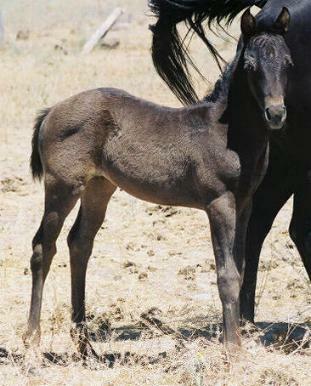 This filly will be big! 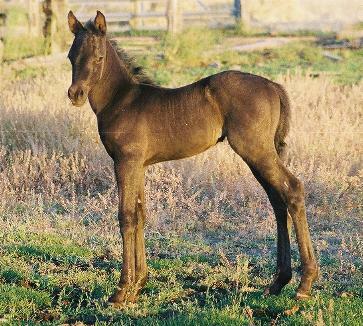 She should mature to 16 HH. With size, bone and an absolutely amazing natural extended trot, she is going to be an awesome sport or dressage prospect. SOLD! Congratulations to Marvin and Karen Smyser of Wind River Appaloosas. She will make an awesome addition to the wonderful herd of Foundation Appaloosas! Aren't they a pretty pair? 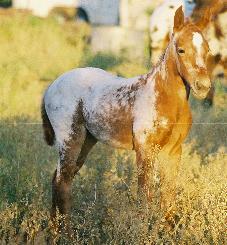 MisticRedCloudSrpriz is a gorgeous chestnut snowcap near leapard filly born on May 27, 2003. She has a beautiful head, awesome hip and is very athletic. She should mature to 15.2 hh. She is 100% FPD and will be a color producing machine. 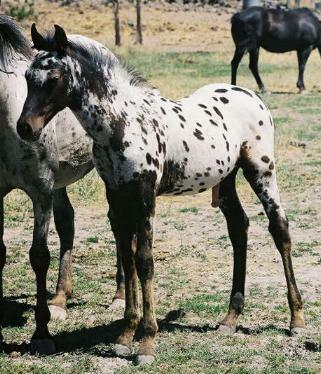 Out of Mistic Rein Cloud and by Rainbows Dreamweaver, she has a who's who of leopard in her pedigree including Mansfield Comanche and Morgan's Leopard plus many more. Asking price is $3000. SOLD! 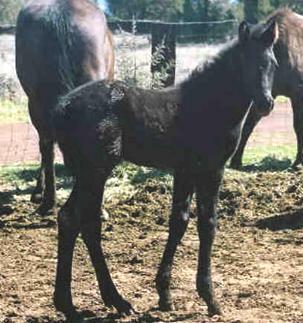 Born on April 1, 2003 Mistic Comanche Spirit is a black near leopard stud colt. This boy is going to be big. Should mature to 15.2 hh +. He is very straight with a gorgeous dishy head and a personality to die for. 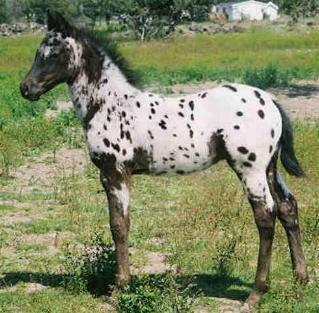 Sired by Rainbows Dreamweaver and out of Mistic Storm Spirit, he is 97% FPD and out of leopard x leopard breeding. 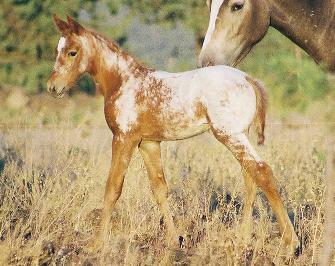 With well known names like Mansfield Comanche, Red Eagle and the Ghost Wind horses many times in his pedigree, he is an outstanding example of what strong appaloosa genetics can produce. 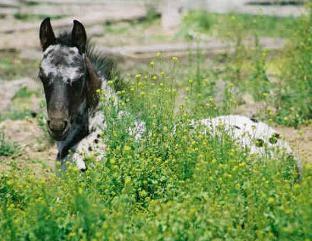 If you are looking for a stallion prospect or just an awesome colored gelding, this is the one! Asking $3000. SOLD! 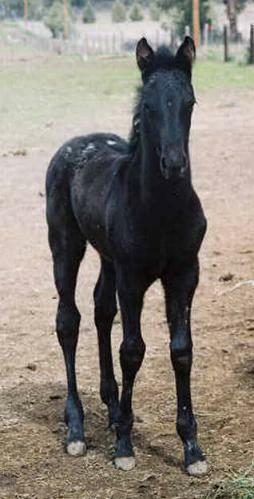 BearPaws MisticDream is an outstanding solid near black filly with characteristics born on June 1st. Like the rest of her siblings, she has an awesome head, great hip and moves like a dream. 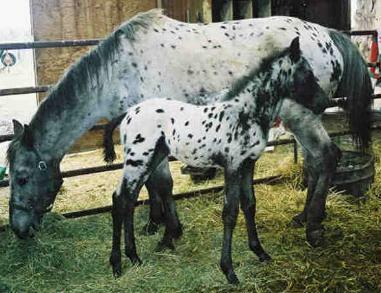 Out of Oaks Mystic Hy Bear, a double Bear Paw bred mare, and by Rainbows Dreamweaver, she is 100% FPD and has many famous names behind her. She should mature to 15 hh. Asking price is $2500. SOLD!